RING - SARAH COVENTRY. "THERESA" HOSTESS GIFT FROM 1979. THIS ITEM WAS NEVER OFFERED FOR SALE, BUT HAD TO BE EARNED. 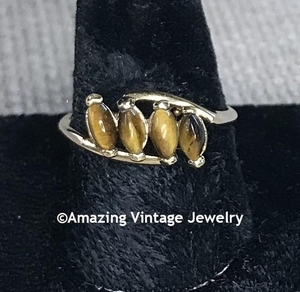 GOLDTONE SETTING WITH 4 TILTED TIGER EYE INSETS. SIZE 8 1/2 - NOT ADJUSTABLE. VERY GOOD CONDITION.